April 20th, 2014. Pastor Steve takes us through nine reasons from God’s Word about what the bodily resurrection of Jesus assures us of. What a great source of encouragement and eternal joy for every believer in the Lord Jesus Christ! 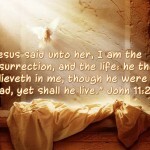 The Lord is risen… He is risen indeed! Does God Predetermine Our Sins? FROM THE PASTOR'S STUDY: What Happens to Babies When They Die? Do They All Go To Heaven? $hould We Be Charging for Mini$try? GENUINE REVIVAL IS MARKED BY FAITHFUL GOSPEL PROCLAMATION"...God has made Him both Lord and Christ, this Jesus whom you crucified." Designed by QuinnCom Copyright © 2019 — CrossChurch.net. All Rights Reserved.